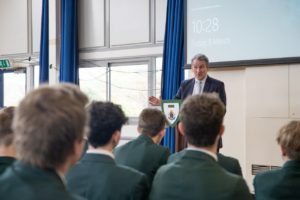 Education Secretary Damian Hinds joined alumni from an Alton school who returned to inspire the current generation to career confidence and academic success. The former students and Mr Hinds returned to Eggar’s School to take part in an event designed to help prepare students for life in the working world and broaden their career horizons. Eggar’s School is one of a thousand state schools and colleges across Britain which have worked with the national education charity Future First to harness the experience of former students to motivate the current generation through ‘old school tie’ networks. Alumni were among 28 professionals who advised 375 students in Years 8 and 10 on writing a personal statement which then formed the basis of a mock interview. Mr Hinds interviewed Head boy Rory Roberts Taylor who hopes to go into politics. Other returning alumni included Catherine Davis and Grace Brassington who works in television production. Future First’svision is that every state school or college should be supported by a thriving, engaged alumni community that helps it to do more for its students. Nearly 240,000 former students across Britain have already signed up to stay connected with their old school or college. They’re inspiring young people as career and education role models, mentors or e-mentors, work experience providers, governors and fundraisers.